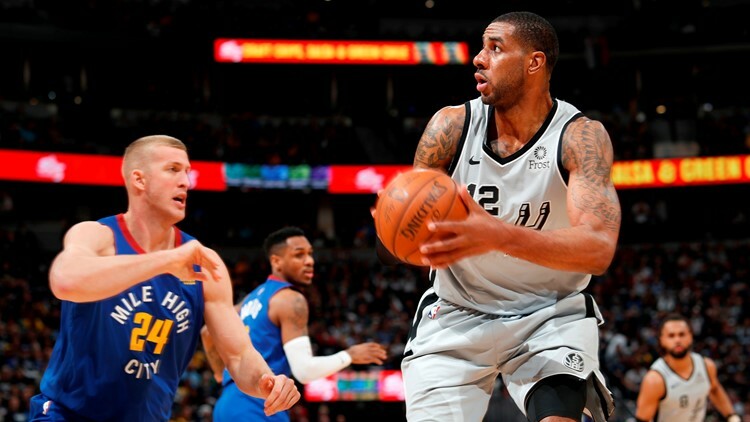 Spurs forward/center LaMarcus Aldridge looks to get off a shot as Nuggets forward/center Mason Plumlee defends in Game 1 of the San Antonio-Denver first-round playoff series Saturday night in Denver. An NBA playoff series is as much a chess match as it is a collection of basketball games. Coaches make moves between games, adjusting to what the other team did in the previous contest. Players, not coaches, win games in the end, of course. But good coaching and strategy are just as critical to success as the talent on the floor. For the Spurs and Nuggets, who meet in Game 2 of their Western Conference first-round playoff series at 8 p.m. Tuesday in Denver, finding ways to get their top scorers going will be among their top priorities. Not that San Antonio forward/center LaMarcus Aldridge and Denver center and Nikola Jokic played badly in Game 1, mind you. Jokic scored only 10 points – 10 below his regular-season average – but he had 14 rebounds and 14 assists to finish with a triple-double in the Spurs’ 101-96 victory. Aldridge had 15 points – he averaged 21.3 during the regular season – and eight rebounds. But Aldridge, who shot 51.9 percent in the regular season, was just 6 of 19 from the field. Slowed by a San Antonio defense that packed the paint whenever he got the ball in the post, Jokic finished with only nine field-goal attempts in the opening game of the series. Jokic has taken nine or fewer shots in a game only 12 times since Oct. 12, and two of those games were against the Spurs. The Nuggets lost both. 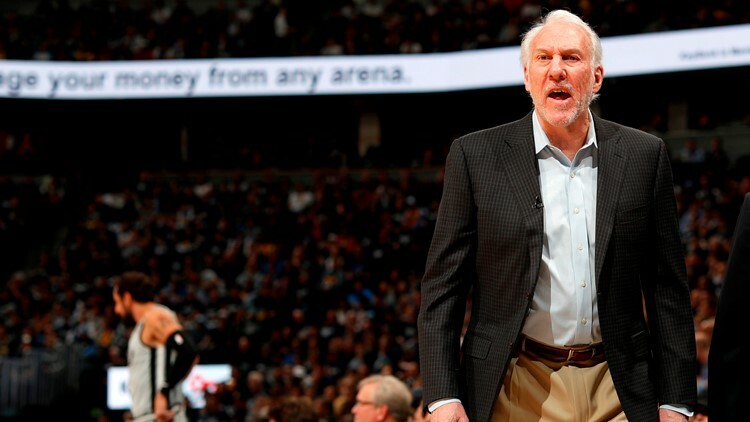 Spurs coach Gregg Popovich, protesting an official's call Saturday night, became the all-time leader in wins among NBA coaches with San Antonio's 101-96 victory over the Nuggets in Game 1. Asked how the Spurs kept Jokic’s scoring in check, Aldridge said: “The same thing they did to me, doubled me, kept me off balance. We just tried to be active on him and tried to make plays. Both bigs kind of never really got comfortable down there. With Aldridge kept under wraps as a scorer, veteran guard DeMar DeRozan and two players making their first playoff starts, point guard Derrick White and guard Bryn Forbes, sparked the Silver and Black with their offense. Aldridge was just happy to get the victory. “I felt good tonight,” Aldridge said. “I just couldn’t get in a rhythm because they doubled me every time I got the ball. It’s not about one of us (he and DeRozan) trying to go for 30, it’s about finding ways to win. If he gets 30 and we win, great. If I get 30 and we win, great. But it’s not really about one of us going for 30, it’s about finding a way to get a win and make our teammates better. Appearing in his first playoff game with the Spurs, DeRozan scored 18 points on 6-of-17 shooting to lead five San Antonio players in double figures, DeRozan also had a team-high 12 rebounds to finish with a double-double. He also had a team-high six assists. 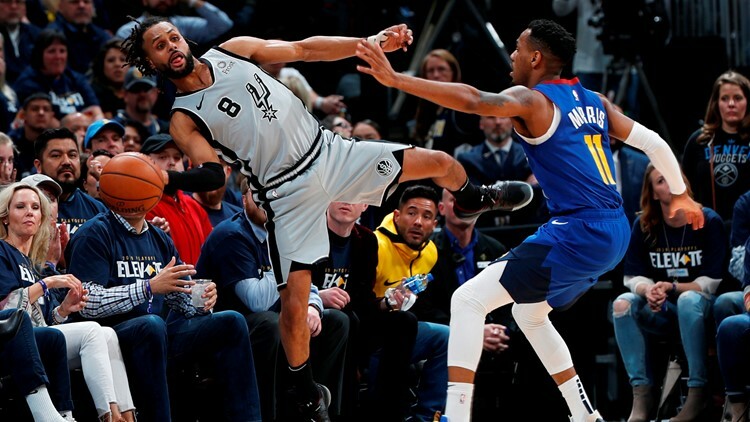 Guard Patty Mills, saving a Spurs pass from going out of bounds Saturday night, scored only four points in Game 1 against the Nuggets, but he hit a jumper that gave San Antonio a 95-89 lead with 3:23 left. White and Forbes finished with 16 and 15 points, respectively. A third-year pro, Forbes hit 6 of 9 shots, including 3 of 4 from the three-point line, and added six rebounds. Rudy Gay also stepped up in a big way, coming off the bench to score 14 points on 6-of-9 shooting. He was 2 of 3 from beyond the arc and also had six rebounds. The biggest star for the Spurs was White, whose performance was described as “spectacular” by coach Gregg Popovich. White had two of the game’s highlights, scoring on a monster dunk over Denver forward Paul Millsap and coming up with a steal that sealed the victory for San Antonio. “I was disappointed I turned it over but I just tried to move to the next play, make another play defensively,” White said, reflecting on the last 69 seconds of the game. And what about his rim-rattling dunk? The best-of-seven series shifts to San Antonio for Games 3 and 4. Game 3 is scheduled for 8 p.m. Thursday at the AT&T Center.